One of the first sushi restaurants I ever went to was in Mexico City, of all places. I was dubious, as this was many years before the Great Sushi Wave of the 1980s hit North America, but an anthropologist friend of mine insisted on it. To my great surprise—and relief—the sushi was excellent, and it was cheap. Since then, I've enjoyed Mexican sushi from Guaymas to Puerto Escondido and from Acapulco to Veracruz. Since most of Mexico is surrounded by water—the Pacific Ocean to the west, and the Gulf to the east, it shouldn't really be news that there would be great sushi made with the freshest fish there. And here in Utah, I've encountered many Latino sushi chefs, including one of my new favorites: Fernando Trejo. Trejo and his wife, Saymi Machuca, own Sáme Sushi, a Japanese restaurant in the space on 300 South that was formerly home to Dojo. She's from Chihuahua; he comes from Mexico City. 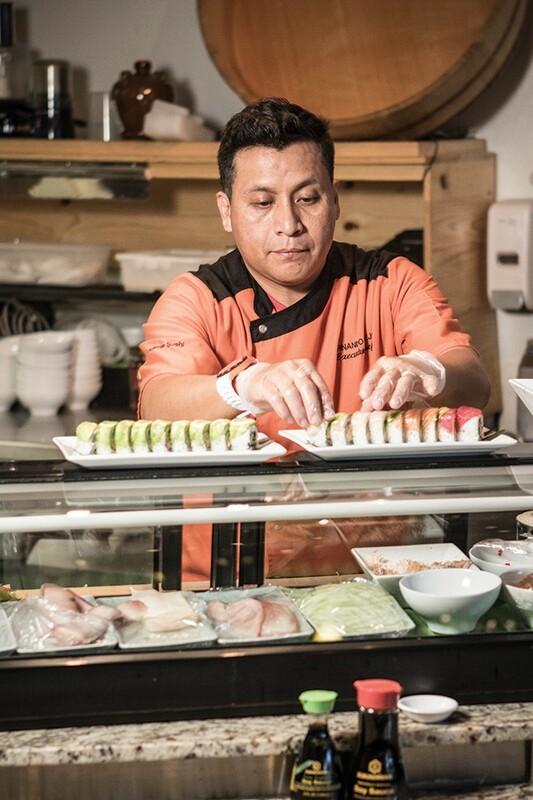 Trejo has worked for 15 years in local restaurants, including at Ichiban, Bambara and Tsunami. And, while the emphasis at Sáme Sushi is definitely on Japanese flavors, South of the Border culinary influences also pop up here and there. I like to think of it as MexicAsian cuisine. And no, I'm not talking about the local phenomenon known as the sushi burrito. The décor hasn't changed from Dojo, and that's a good thing. I love the design—stonework on one side of the restaurant, tables with curtains for privacy on the other side, soothing blue highlights and ceiling lamps fashioned from upside-down rice-paper umbrellas. It's a very modern space but also very warm and appealing. I miss Dojo's ramen, which was some of the best in Utah, but there's a lot to like about the Sáme Sushi menu—especially the prices. I can't say my first visit got off to a great start. A very shy and seemingly inexperienced server could barely be heard as she whispered answers to questions like, "Do you serve wine?" She said she thought they served wine and that she would check to see what they had. Upon her return, she said "We have Mark something ..." "Mark West?" my wife inquired. "I think, maybe," our server said. "I'll check." Well, lo and behold, she returned to the table, this time with a beverage list that included beer, wine and sake. Huh. So, we ordered a bottle of Mark West Chardonnay ($27) and an assortment of nigiri. Sáme Sushi offers both nigiri and sashimi priced at $4.50 for two pieces, which is not bad. We tried hamachi, maguro and tai (yellow tail, tuna and red snapper) in nigiri form (on thumb-size rectangles of rice). The nigiri was fine—fresh tasting, with good quality sushi rice—but was nothing remarkable, served solely with wasabi and ginger slices. At some of my favorite sushi restaurants here and in Park City, the chef will kiss the nigiri with the tiniest drop or two of sauce or seasoning to match the fish's flavor profile, making it more interesting than just eating raw fish. At our server's suggestion, we ordered the restaurant's namesake Sáme roll. Sáme mean "shark" in Japanese, but there's no shark on the Sáme Sushi menu. The Sáme roll ($9.50) is yellowtail, salmon, shrimp tempura, avocado and cucumber slivers rolled and topped with thin-sliced lemon and ponzu sauce. It's a very good maki roll with interesting textures and flavors. We also enjoyed the Color Me Fancy roll ($9.50), which is 10 pieces of crab, yellowtail, tuna, salmon and red snapper with diced cucumber and topped with sliced avocado. It's a bit unusual, insofar as the fish is layered on top of the roll, and not every piece is identical. Some pieces are topped with tuna, some with snapper, etc. No two bites are exactly alike. 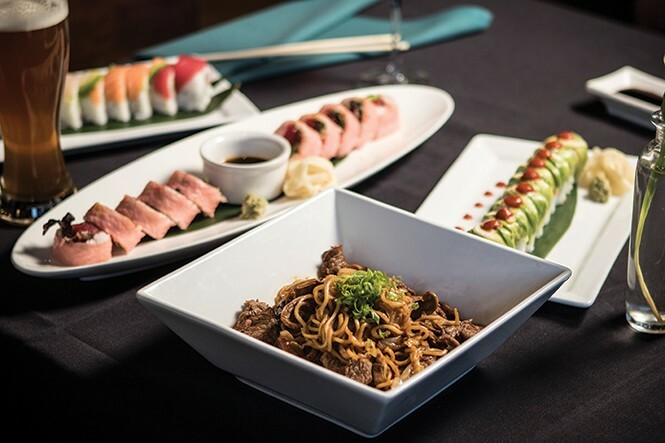 We rounded out our first visit to Sáme Sushi with beef yakisoba ($12.50)—pan-fried ramen-style noodles with cabbage, onion, mushrooms, scallions and tender slices of beef. Unfortunately, the yakisoba—which I think would have been great with just a little seasoning—was drowned in a bitter Japanese barbecue sauce that held little appeal. Skip the yakisoba. The low prices at Sáme Sushi cause me to wonder why the place isn't packed every night. Granted, the location is a bit hidden, but only $13.95 for Kobe beef teriyaki (including miso soup, rice and tempura veggies)? Are you kidding me? Or, how about a 10-ounce New York steak with teriyaki demi-glace for a mere $17.95? But we were really bowled over by the price of the sushi and sashimi combinations. We ordered the Large Sashimi Combination, which was 15 pieces of sashimi (five different types of raw, sliced fish) for $18.95. I've seen restaurants charge $30 or more for the same quantity of sashimi. Granted, Sáme Sushi doesn't have the most exotic or rare fish available, but if you like the classics, this is the place to swim in sashimi without breaking the bank. Oddly, our sashimi came with only a single bowl of miso for two people. I must say, however, that our server on the second visit was terrific. Sitting at the sushi bar, we got to know a little about Fernando Trejo. He's an extremely generous and kind man, a guy who—until opening Sáme Sushi—had always held two restaurant jobs at once. In between chatting about the dishes of Chihuahua, Puebla, Oaxaca and Mexico City, we enjoyed a roll named for him: the Trejo. This, by far, was my favorite: a fiery Mexico-meets-Japan combination of tuna, jalapeño and spring salad with cilantro wrapped in pink-colored rice paper and drizzled with spicy Asian vinaigrette ($9.50). Hasta la vista, Sáme. We'll be back.